The 2017 Ford F-Series Super Duty has been completely redesigned for the first time since 1999. The Super Duty now features a high-strength aluminum cargo box and body panels, which have reduced the weight of the truck by as much as 350 pounds. 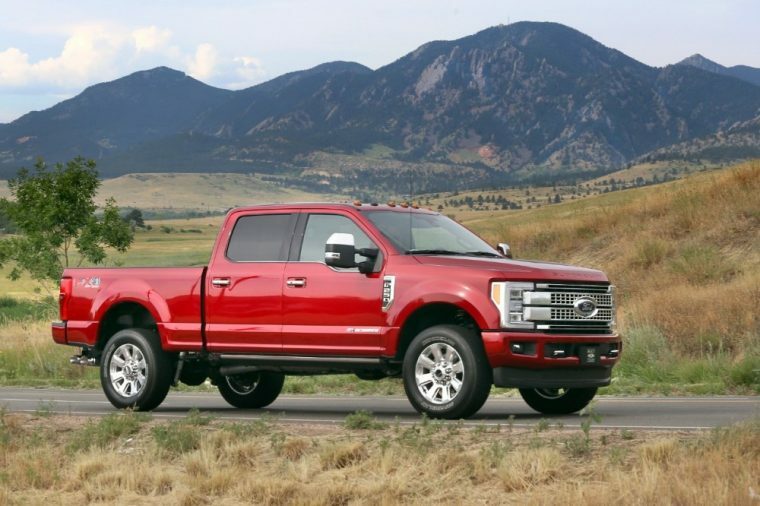 This weight loss is important because the Super Duty also includes a new chassis that uses 95% high-strength steel. This updated platform should make the work truck even more capable than previous versions. The 2017 Ford Super Duty is available in three unique body styles and consumers get to choose between a 6.75-foot bed and a longer 8-foot option. What’s new for the 2017 Ford F-Series Super Duty? 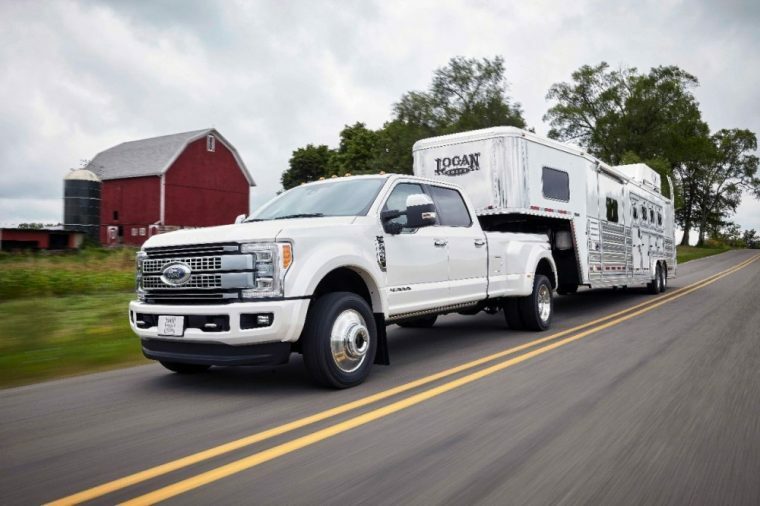 In addition to its redesigned body and chassis, the new Ford Super Duty is available with a host of new advanced tech equipment. Each new Super Duty can be purchased with full LED lighting, a new Trailer Reverse Guidance system, adaptive cruise control, and fancy new cup holders. The 2017 Ford Super Duty has a look that’s all its own. 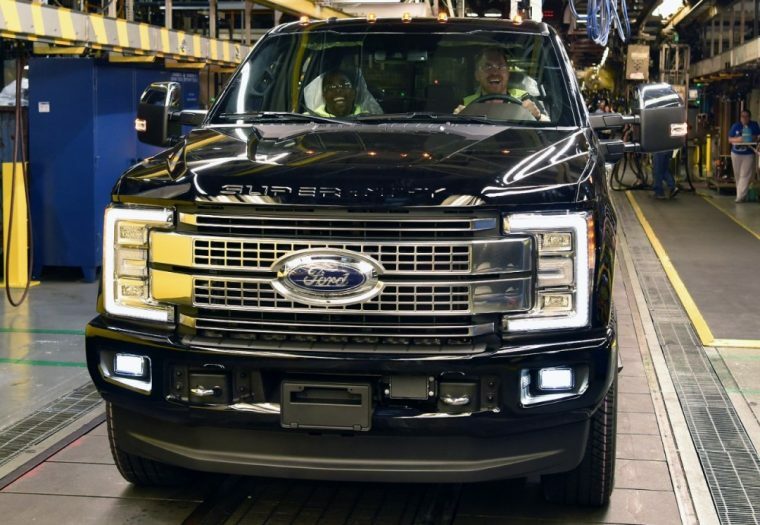 Visual highlights of the truck include its massive two-bar horizontal grille design, which is complemented by the company’s signature C-shaped headlights. The most affordable model in the 2017 Super Duty lineup, the F-250 XL, comes standard with desirable features such as a 2.5-inch trailer hitch receiver, front tow hooks, and 17-inch steel wheels. In addition, consumers who can afford to splurge on higher end models get even more eye-catching features such as 5-inch chrome tubular cab steps, 20-inch polished aluminum wheels, and quad beam LED headlamps. Exterior color options for the new Super Duty include Blue Jeans Metallic, Shadow Black, and Ingot Silver Metallic. Contains the same exterior features as the F-250 XL. Contains the same exterior features as the F-250 Lariat. Contains same exterior features as the F-250 King Ranch. Contains the same exterior features as the F-250 Platinum. The standard engine for the 2017 Super Duty is a gasoline-powered 6.2-liter V8 that provides up to 385 horsepower and 430 lb-ft of torque. This engine is paired with Ford’s TorqShift six-speed automatic which has been revised for the 2017 model year. 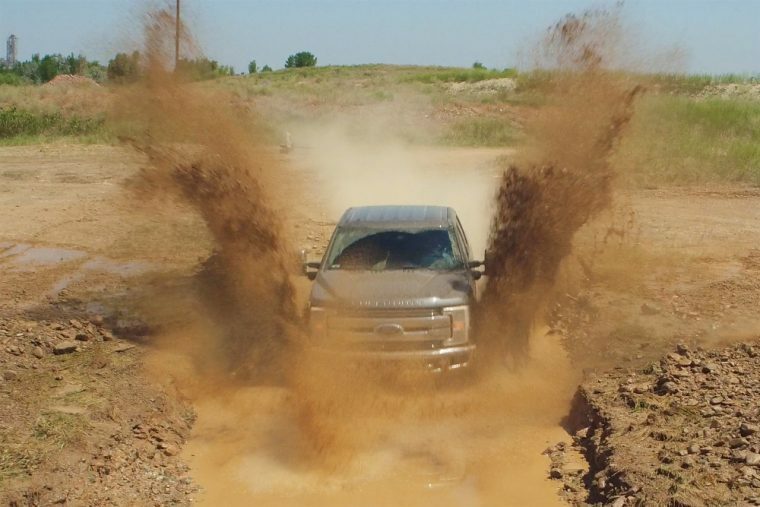 The six-speed auto is the only transmission that’s consumers can get with their new heavy-duty Ford pickup, but consumers do get to choose from either rear-wheel or all-wheel drive. In addition, Ford offers a 6.7-liter turbodiesel V8 that’s rated at 440 horsepower and 925 lb-ft of torque. When equipped with this powerful motor, the new Super Duty is capable of towing up to 32,000 pounds. Because the 2017 Ford Super Duty has a Gross Vehicle Weight Rating (GVWR) of more than 8,500 pounds, the EPA doesn’t require fuel economy testing to be performed on Ford’s new heavy-duty truck. Moreover, this pickup comes with either a 34- or 48-gallon fuel tank depending on how each buyer chooses to configure their truck. Ford has claimed that when it’s new Super Duty is equipped with the turbodiesel V8 and 48-gallon tank; it can provide a driving range of close to 1,000 miles. There are three cab configurations offered with the 2017 Super Duty. These body styles are regular cab, extended cab, and crew cab. 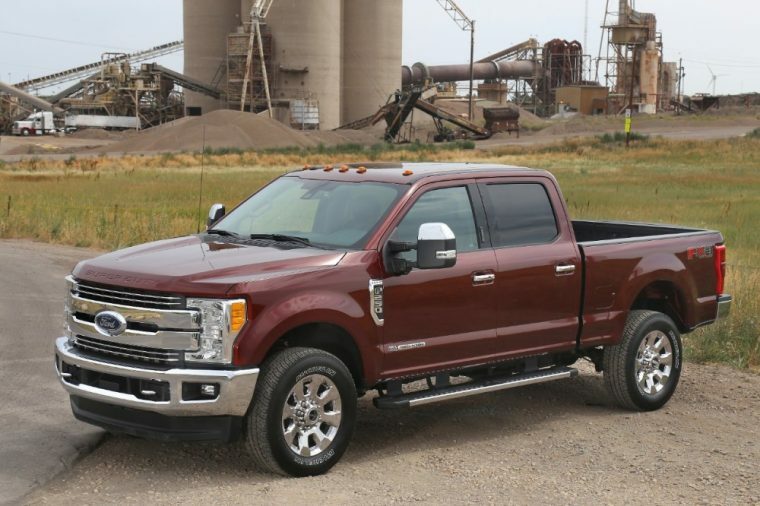 The extended cab model is six inches longer than last year thanks to the Super Duty’s redesigned body, which it borrowed from the smaller F-150 pickup. 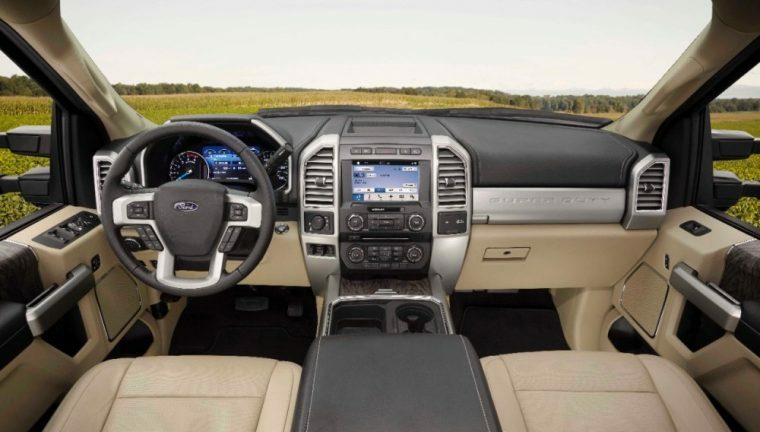 Every new Super Duty comes standard with a four-speaker sound system, air-conditioning, and vinyl flooring, which makes the interior easier to clean after muddy work boots have repeatedly gone through the vehicle. The cabin is also quiet and comfortable due to the extensive use of sound-insulating materials in the truck’s design. In addition, the interior can be equipped with a long list of luxury amenities depending on how much the consumer is willing to spend. Some of these available features include heated and cooled seats, a leather-wrapped steering wheel, a navigation system, and Apple CarPlay compatibility, just to name a few pieces of optional equipment. While it is true that the slightly less powerful Ford F-150 pickup was able to earn IIHS Top Safety Pick honors, the larger Super Duty model has yet to undergo these safety tests. Each 2017 Super Duty comes standard with a tire-pressure monitoring system, Trailer Sway Control, and Ford’s innovative MyKey technology, which parents can use to set top speeds and audio volume limits for secondary drivers. Furthermore, those people who opt for the higher-level Platinum trim will get advanced safety equipment such as lane departure warning and blind spot monitoring system with cross-traffic alert and trailer tow.